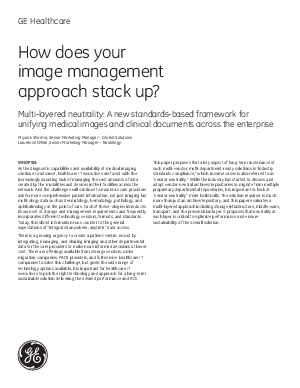 As the diagnostic capabilities and availability of medical imaging continue to advance, healthcare IT executives are faced with the increasingly daunting task of managing the vast amounts of data created by the modalities and devices in their facilities across the network. This disparate data frequently incorporates different technology vendors, formats, and standards. There is a growing need to create a patient-centric record by integrating, managing, and sharing all this imaging and other departmental data for care providers to make more informed decisions at lower cost. This paper proposes that a key aspect of such multi-vendor, multi-department-ready solutions is “industry standards compliance,” which in some cases is also referred to as “vendor neutrality.” Read the whitepaper to learn more.